Najib’s rhetorical promise of a political transformation that would carve a path of greater democracy for his citizens had once again shattered following the unleashing of mayhem during 428 Bersih 3.0 rally on Saturday. The “Reformasi” movement dated back to 1998 and wave after wave of BERSIH movement bear certain resemblances, which had hundreds of thousands of Malaysia surge in the streets to rally in solidarity against the establishment of the regime, determined to redress injustice where their rights are violated by unconstitutional acts of the ruling government yet eventually experienced violently crackdown by the country’s armed forces. As the world is striding forward in advocating higher level of democracy and human rights; it is indeed a woeful fact that our beloved country is still getting stuck in the rut, entrenching its authoritarian regime and even heightening its suppress over people’s freedom and social forces. Despite of the socio-economic development we have been achieved all these years, the trajectory of democratization is still nowhere in sight. Modernization theory that sees industrialization, economic progress, prevalent urban residence and the like as preconditions for democratization is deemed to be irrelevant in the context of political transition for Malaysia. Bersih 3.0 – held by the Coalition for Clean and Fair Elections, also known as BERSIH, pressing the government to review Malaysia’s election system and clean up the electoral roll which is allegedly tainted by fraudulent voters – is not merely a national movement, but has now becoming a global phenomenon sweeping all over the globe, involving 80 cities across 35 countries where there are Malaysians. The rising of the unprecedented civic engagement ever since the unfolding of Bersih 2.0, if not the first round of Bersih movement dated back to 2007, and the capacity of the public appeal that it has successfully wielded can hardly be undermined, despite Najib administration ignorantly denied it. Hundreds of thousands of people thronged the capital Kuala Lumpur to participate in Bersih 3.0 peaceful sit-in by accessing various routes, as early as the night before the historic day, in a bid to bypass the roadblocks or any other form of “preventative” attempt taken by the authorities. It was a peaceful rally with a crowd of enthusiastic, cheerful, boisterous and well behaved supporters that reflected a broad cross-section of Malaysian society, it was indeed peaceful and festive for hours. The international delegates, who were here to observe the election system said that the rally was commendable as it showed that Malaysian were persisted to challenge the shadow of fear in order to uphold democracy despite the hardships encountered when attending the rally. According to several testimonies by the participators of Bersih 3.0, the event had kicked off peacefully outside the zone barred by law, and only turned violent shortly after the Bersih leaders declared dismissal. Riot police then started to spray chemical-laced water and fire teargas into the crowd whilst making arbitrary arrests without issuing any prior warning. There were even many teargas canisters thrown at Masjid Jamek train station by the police and caused the crowd badly hurt. Regardless of the pouring criticism targeted on BN-led government’s attack upon unarmed demonstrators and also the press is disproportionate and excessive, and also undeniably in breach of the right to freedom of expression, Najib’s administration remained stubbornly persistent in its wrongdoing. In fact, Najib’s flip-flop in the way he handled Bersih 3.0 is a clear indication of his incapability as a leader. Article 10 of Federal Constitution bestowed the freedom of speech, assembly and association on his people. Yet, as the world is watching another brutal and senseless violence on Bersih peacefully sit-in, the call for the right for assembly without the fear of force raining down was drenched by the act of violence occurred during the rally. The Peaceful Assembly Bill was mooted by the Najib Administration as part of its Malaysia Day promises to allow greater democracy and civil liberties. He then said that the Bill was “revolutionary” and a giant leap towards improving individual freedom. When the Peaceful Assembly Act (PA 2011) was enacted last year, it was to act as a substitute to the archaic Section 27 of the Police Act 1967. According to Inspector General of Police (IGP) Ismail Omar, the said section was to be amended to allow a review on the people’s right to hold public rallies. In another news report, Prime MinisterNajib said the review was to also take into consideration the international norms with regards to public rallies. And yet, the so-called “revolutionary” changes that were made were less revolutionary and more restrictive and a pinch of draconian that contradicted the intentions of the Federal Constitution as well as the international norms. Among the contradictions of the new PA 2011; is the contradiction of Article 10(1) (b) of the Federal Constitution which guarantees the freedom of peaceful assembly, which is also enshrined in Article 20 of the UDHR and Article 5 and 12 of the UN Declaration on Human Rights Defenders. Not to mention Article 15 of the UN Convention on the Rights of the Child, in which Malaysia ratified in 1995. Dams, reservoirs and water catchment areas, water treatment plants, electricity generating stations, petrol stations, hospitals, fire stations, airports, railways, land public transport terminals, ports, canals, docks, wharves, piers, bridges and marinas, places of worship Kindergartens and schools. Section 27 on the other hand, does not discriminate places to assemble or have processions. What the said section does provide is if the “meeting or procession is not likely to be prejudicial to the interest of the security of Malaysia or any part thereof or to excite a disturbance of the peace”, the Officer in Charge of the Police District will issue a licence. Hence, an assembly and a procession are permitted to occur at any place with the discretion of the police. “public place” includes every public highway, street, road, bridge, square, court, alley, lane, bridle way, footway, parade, wharf, jetty, quay, public garden or open space, and every theatre, place of public entertainment of any kind or other place of general resort to which admission is obtained by payment or to which the public have access. a road, a place open to or used by the public as of right or a place for the time being open to or used by the public whether or not the place is ordinarily open to or used by the public, by the consent of the owner or occupier or on payment of money. Allowed, subject to issuance of permit. Prohibited completely, although “processions” are allowed. No prohibition on participation of children under 15 years old. Children under 15 years old prohibited from participating in an assembly, other than religious assemblies, funeral processions, assemblies related to custom and assemblies approved by the Minister. No distinction between citizens and non-citizens Non-citizens do not have the right to participate. None. The list is provided in the above paragraph and within 50 metres from the prohibited place. Organiser of an assembly is to apply to the police for a licence. An assembly, meeting or procession which takes place without a licence is deemed to be an unlawful assembly. Organising and participating in an unlawful assembly are offences. In the official published bill online, the time to notify by the organisers was 30 days. However, during the passing of the act, that period was cut short to 10 days.Also in the original bill, the police was to inform the stakeholders’ details of the planned assembly within 48 hours. The new amendment during the passing of the act was 24 hours. The other amendments include, changing the words “12 days” to “five days” for the police to respond to organisers with details of any restrictions or conditions. Changing the words “four days” to “48 days” for the time for the organisers to appeal against restrictions set by the police. Lastly, is the changing of words of “six days” to 48 hours for the minister in charge to respond to the appeal by the organisers. Fine of between RM2, 000 to RM20, 000.00 and imprisonment for a term not exceeding 1 year. Maximum RM 10,000 and maximum RM 20,000 depending on the offences under the PA 2011. Police can deny issuance of licence to an assembly. Police can impose conditions and restrictions on an assembly which includes conditions and restrictions on the date, time, duration, place, manner and conduct of the assembly, and any other restrictions the police deem necessary or expedient. A police officer may arrest without warrant any person reasonably suspected of committing any offence under the section. Any police officer may stop and assembly, meeting or procession held without a license or which contravenes the conditions of a license, and may order the persons participating to disperse. A police officer may arrest without warrant any organiser or participant: (i) who refuses or fails to comply with any restrictions or conditions; who has in his possession any arms; or (iii) who recruits or brings a child to an assembly not permitted under the Act. Before exercising his power of arrest, police officer shall take necessary measure to ensure voluntary compliance. A police officer may order an assembly to disperse if (i) it is held at a prohibited place or within 50 metres of such place (ii) the assembly becomes a street protest (iii) any person at the assembly does or something that would tend to promote ill will, discontent or hostility amongst the public or does something that would disturb public tranquillity (iv) any person at the assembly commits any offence under written law (v) the participants do not comply with restrictions or conditions imposed by the police or (vi) the participants engage in unlawful or disorderly conduct or violence towards persons or property. *Reproduction of Malaysian Bar FAQ on the Peaceful Assembly Bill at http://www.malaysianbar.org.my/index.php?option=com_docman&task=doc_details&gid=3461&Itemid=332 and amendments made during the passing of the act. That being said, the PA 2011 seems to be more lenient in the sense of enforcements against those in the assembly. However, in a close up, it is nothing but aesthetic protection of those in the assembly. This comes from the vague terms “necessary measures to ensure voluntary compliance”. The act does not define what is necessary to ensure the voluntary compliance of the organisers and participant. If the intent of the Parliament during the passing of this act was to allow arbitrary use of force such water cannons with chemical-laced water, tear-gassing innocent civilians as well as sealing off public places such as Merdeka Square from citizens of Malaysia, then it is safe to say that the “revolutionary” changes are intended to be autocratic and well beyond draconian then the former Section 27 of the Police Act. On April 19, the last day of the parliamentary session, the government tabled eight Bills for debate that day. It became a marathon session testing the stamina and resolve of the opposition. The first was the Election Offences (Amendment) Bill 2012 which started at 10am and the last was the Printing Presses and Publications (Amendment) Bill 2012 which ended at 3.15 the next morning. In between, the other Bills debated included Universities and University Colleges (Amendment) Bill 2012, Private Higher Educational Institutions (Amendment) Bill 2012, Educational Institutions (Discipline) (Amendment) Bill 2012, the Jasa Perkasa Persekutuan (Remembrance Allowance) Bill 2012, Pingat Tentera Udara (Remembrance Allowance) Bill 2012 and the Capital Markets and Services (Amendment) Bill 2012. For comparison, the Dewan Rakyat took three days to debate the National Kenaf and Tobacco Board Bill 2008. Although the replacement of tobacco planting with kenaf is important, it cannot be more important than the Bills to ensure free and fair elections; ensuring students are able to exercise their constitutional freedom of assembly; and citizens are entitled to the freedom of expression. All these were to be debated in the Election Offences (Amendment) Bill 2012, Universities and University Colleges (Amendment) Bill 2012, Private Higher Educational Institutions (Amendment) Bill 2012, Educational Institutions (Discipline) (Amendment) Bill 2012 and the Printing Presses and Publications (Amendment) Bill 2012. There is no doubt that the BN government wanted to bulldoze the Bills with the minimum debate to avoid public scrutiny and censure. This is because the amendments were not designed to provide for greater democracy instead they provided for greater restrictions. The transformation which is heralded by Prime Minister Najib Abdul Razak (left) in tabling the Bills is nothing more than an illusion. Like David Copperfield’s magic tricks, the smoke and mirror effect of the Bills cannot stand scrutiny in daylight. Hence the Bills were pushed through in the dead of the night. The Election Offences (Amendment) Bill 2012 has been described by Ambiga Sreenevasan, co-chairperson of the Steering Committee for the Coalition for Clean and Fair Elections (Bersih 2.0), as “solely for the purpose of making the voting process less transparent”. The Bill did not implement any of Bersih’s eight demands for a clean and fair election or any of the 22 recommendations of the Parliamentary Select Committee (PSC) on election reform. The Bill removed the candidate’s right to have his agents monitor the process of voter identification to ensure that voters are at the proper polling centre and directed to the correct polling stream. This is a crucial process because many voters will be denied their rights to vote if they are unable to obtain confirmation that they are at the correct polling centre or their names are listed in the electoral roll. There have been many incidents in previous elections where voters were sent on a wild goose chase to find their voting centres. Unable to do so, they eventually gave up and were thus deprived of their right to vote. Pakatan Rakyat and the public have cause for concern that the 13th general election will be tainted by widespread electoral fraud. From December 2010 until September 2011, Pakatan Rakyat has found that 106,255 voters have been removed from the electoral roll without their knowledge. The Election Commission (EC) has changed the voting centres for 31,294 persons without their knowledge or consent on the pretext of the EC correcting parliamentary boundaries. This is illegal because any change in a parliamentary constituency requires the approval of two thirds majority in the Dewan Rakyat, which has not been obtained. There are 820 cases where there are 100 or more voters staying at one address. There are 1,259 cases where there are between 51 and 100 voters at one address. There are 3,254 cases where there are between 21 and 50 voters at one address. There are 6,002 cases where there are between 11 and 20 voters at one address. There are also 2,425,045 voters whose authenticity cannot be verified because the electoral roll only specifies their locality but not their addresses. Parti Keadilan Rakyat has detected a trend where the seats it is contesting have registered a substantially higher number of new voters compared to those held by BN, for example:Subang 27,765 new voters; Kapar 21,606; Kuala Langat 17,172; Selayang 16,189; Gombak 15,467; Gelang Patah 17,356; Bukit Katil 16,206; and Hulu Selangor 16,481. The amendments to the Election Offences (Amendment) Bill 2012 by prohibiting the presence of observers will lead to reduced scrutiny and prevent electoral fraud. The government has not provided any convincing argument to justify the reduced scrutiny. Sivarasa Rasiah, the MP for Subang, has described the amendments as confirmation of BN’s plans to steal the 13th general election. The amendment will not improve Malaysia’s score for greater political rights and civil liberties. 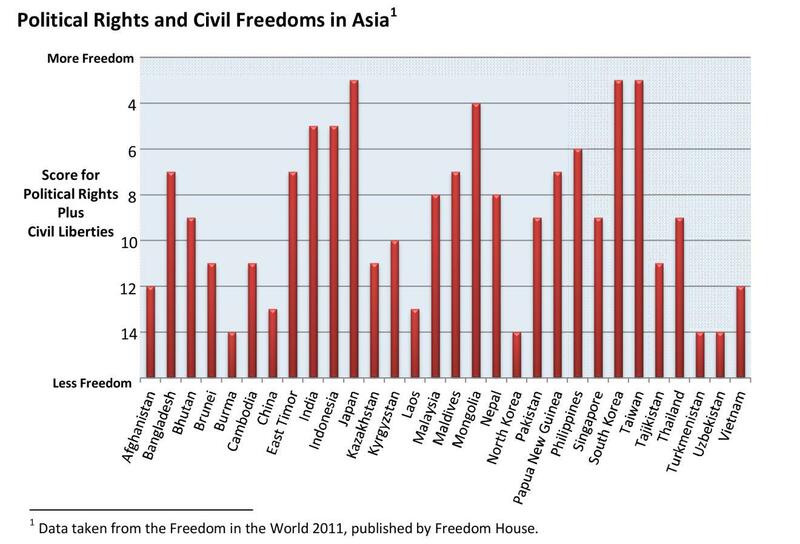 The Asian Network for Free Elections recently released a chart assigning a score for political rights and civil liberties to 30 countries in Asia. It demonstrates that Malaysia still has a long way to go in pursuing greater political rights and civil autonomy to keep on par with the democratic development achieved by other countries such as Taiwan, Japan, South Korea, India and even our neighbour Indonesia. In fact, the presence of observers, whether from non-governmental organisations or representing the election candidates is an inseparable aspect of voting process, particularly within a democratic system. In the US – a country that is widely credited with its relatively complete and healthy democracy, any candidate is allowed to have as many observers to be present during the election and also during the counting of the ballot papers. The presence of observers shall include every phase of an election, such as in the preparation and mailing of ballots, checking the eligibility of voters, and the opening and calculation of ballot papers and the like. Such an amendment to rule out the presence of observers in the booth is conspicuously in conflict with the nature of democracy. What more, this is overtly in contrast with the political transformation programme, which has been vigorously introduced and promoted by a PM who portrays himself as the icon of successful transformation while playing down systemic failures and crisis of political legitimacy faced by the BN-Umno regime. The amendments have removed another one of the check-and-balance to ensure a clean and fair election. The EC and the prime minister should have no fear of observers if the election is clean and fair. They would only have cause for fear if they intend to commit election fraud. The people must therefore judge why the BN government did not allow sufficient time for the public to appreciate the significance of the amendments and what they forebode. The people must question BN for pushing the amendments in the darkest hours of the night, and not in the light of day. For those who prefer darkness over light, it has been said: “And this is the judgment: the light has come into the world, and people loved the darkness rather than the light because their works were evil. “For everyone who does wicked things hates the light and does not come to the light, lest his works should be exposed. BN was able to approve the amendments because of their majority in the Dewan Rakyat. The amendments would similarly be approved by the BN majority in the Dewan Negara. Therefore, the only avenue left for the people to object is by attending Bersih 3.0. WILLIAM LEONG JEE KEEN is MP for Selayang. This article was written in collaboration with Political Studies for Change, a local research institute and political think-tank. 22 recommendations zoomed in by the Parliamentary Select Committee (PSC) that tabled in Parliament on 3rd April 2012 had triggered uproar. The Pakatan Rakyat representatives expressed their disappointments and dissatisfactions over the PSC’s final report as it failed to address the fundamental concerns on the election system, as well as the outstanding issues raised by electoral reform pressure group, BERSIH, in which the most pertinent being the lack of measures to clean up the electoral roll. Allowing EC officials and media personnel to cast a postal vote. Pre-registration process for Malaysian aged 20 as voter. A minimum of 10 days campaigning period during election. A study on automatic registration process for the future. The much awaited PSC’s final report nevertheless, showed no intention in rectifying many of the irregularities in the electoral process despite many suggestions have already been put forward, primarily from the Coalition for Free and Fair Elections or BERSIH and Pakatan Rakyat. Even more daunting, there was no fixed timeline prescribed for all its 22 recommendations, implying that the polls process would be just as fraudulent in the coming 13th General Election. Thus, there is reason to believe that the PSC is merely a customary exercise to show the opportunistic willingness of Najib administration to concern of the people’s demand without any commitment made, hence very much a political show before the 13th General Election. Change the status of some 45,000 spouses of police officers from postal voters to normal voters because they are not eligible to be postal voters, within 15 days of the report being tabled. Unfortunately, the inclusion of the minority report, which was to include the dissenting views raised by the panel of three Pakatan Rakyat representatives had been denied by Dewan Rakyat Speaker Pandikar Amin Mulia. According to the Speaker, it was merely a splintered opinion and there were no precedents in parliamentary practices in other Commonwealth nations of the inclusion of a minority report. Despite the cases of New Zealand and Jamaica had been pointed out by the opposition to counter Pandikar’s stance, yet the Speaker insisted on refusing their claims and altogether obliterated the diversity of views expressed within the PSC. The PSC’s final report has not only been criticized by Pakatan Rakyat but also by Bar Council for purportedly failing to touch on specific issues pertaining to discrepancies in the current electoral roll. Bar Council President Lim Chee Wee described the report as incomplete and inadequate as “the measures recommended by the PSC in relation to the electoral roll do not engender faith and confidence in the integrity and veracity of the principal electoral roll”. Crucially, the PSC had missed an ideal opportunity to deal with the EC, which allegedly shirk its responsibility and lack of commitment in implementing reforms. As we are now in the immediate prelude to the 13th General Election, the disclosure of many irregularities and discrepancies in the electoral roll which has yet to receive serious attention and practical rectification from the authority left no alternative for the BERSIH’s steering committee but to call for another round of peaceful demonstration on 28 April 2012 at Dataran Merdeka. Perhaps, Najib’s administration and the EC has not yet realized the growing magnitude of public concern over the need for electoral reform and once again underestimated BERSIH’s power to galvanize public support. To date, EC has only implemented one of BERSIH 2.0’s 8 demands, which is by adopting indelible ink. PSC on the other hand accepted the appeal for free and fair media access. The demands to clean up electoral rolls, reform postal ballots and strengthen public institutions are partially addressed yet there is no guarantee that the coming election would be free from fraud. Last but not least, the demands to stop corruption and stop dirty politics are completely ignored as if they are not an issue at all. The unusual spike in voter numbers in certain constituencies, such as in Selangor wherein the number of registered voters has tremendously increased 22 per cent ever since Pakatan Rakyat dominates the state administration. The voters’ number has currently exceeded 340,000. 820 cases reported exposing the existence of 79,098 voters registered to a single address with at least 100 other voters. The voting constituency of 3.1 million non-residential voters did not correspond with the voters’ IC address. The presence of 59,000 suspicious voters, which were amongst 65,455 foreigners in the electoral roll, including descendants from the Philippines, Indonesia, Afghanistan, Spain, Malta and Slovakia. According to the Malaysian Electoral Roll Analysis Project (MERAP), their IC numbers did not contain the “71″ code but they were too old to be born in Malaysia. Analysis on both the 2008 and 2010 electoral rolls by cross-referencing with the December 2011 roll had revealed that 106,743 names were deleted while 6,742 new ones were added without any indication or reason stated for deletion or addition. The abrupt increase of the EC officers from 140,000 to 240,000, and having all of them registered as postal voters. According to the latest news by theMalaysianInsider, the EC has launched a special information booklet to counter all the “allegations” made by opposition lawmakers and civil society groups, which are said to discredit Malaysia’s election process. The 12-page booklets, costing RM4 each, consisted of EC’s responses to 12 allegations, including issues of the over 40,000 ‘doubtful voters’ in the current electoral roll, the alleged over-registration of voters in one single address, registration of foreigners as voters, the EC’s move to correct the voting localities of some 19,000 voters and others. Furthermore, EC chairman Abdul Aziz Mohd Yusof repeatedly stressed that it was impossible for any country to have an electoral roll that is 100 per cent free from discrepancies and flaws. Perhaps, the EC chairman has totally forgotten the fact that an accurate and impartial electoral register is the pivot to the whole issue of whether the exercise of the vote is free and fair! In fact, skepticism has already been revolved around the integrity and trustworthiness of the EC, and its role is constantly being questioned. Now that the PSC’s final report failed to impose directional supervision upon the EC to further rectify and improve election process in achieving a fair and clean election, the people’s skepticism about the electoral reform had been proven right. Considering the audacity of the government led by BN, which silently took legislative moves to push forward the Election Offences Act (Amendments) 2012 and bulldozed through parliament by the last day of the sitting on 19 April 2012, EC that claimed itself as an agency that “supports the system of Parliamentary Democracy and securing rights of citizens to choose their representative, as well as to manage, regulate and handle the elections fairly and independently” had taken no endeavor to adhere its mission. Ironically, it has been granted unimpeded authority and access to dominate the voting process ever more than before through the amendments of the Election Offences Act. Being a cohort of the current ruling party, this is undoubtedly the reason why EC continues to remain silent. On 19th April 2012, the last day of the Parliamentary session, the Government tabled 8 Bills for debate that day. It became a marathon session testing the stamina and resolve of the opposition. The first Bill was the Election Offences (Amendment) Bill 2012 which started at 10:00am and the last Bill was the Printing Presses and Publications (Amendment) Bill 2012 which ended at 3:15am the next morning. In between, the other Bills debated included Universities and University Colleges (Amendment) Bill 2012, Private Higher Educational Institutions (Amendment) Bill 2012, Educational Institutions (Discipline) (Amendment) Bill 2012, the Jasa Perkasa Persekutuan (Remembrance Allowance) Bill 2012, Pingat Tentera Udara (Remembrance Allowance) Bill 2012 and the Capital Markets and Services (Amendment) Bill 2012. For comparison, the Dewan Rakyat took 3 days to debate the National Kenaf and Tobacco Board Bill 2008. Although the replacement of tobacco planting with kenaf is important, it cannot be more important than the Bills to ensure free and fair elections, ensuring students are able to exercise their constitutional freedom of assembly and citizens are entitled to the freedom of expression which were to be debated in the Election Offences (Amendment) Bill 2012, Universities and University Colleges (Amendment) Bill 2012, Private Higher Educational Institutions (Amendment) Bill 2012, Educational Institutions (Discipline) (Amendment) Bill 2012 and the Printing Presses and Publications (Amendment) Bill 2012 Bills. There is no doubt that the Barisan Nasional Government wanted to bulldoze the Bills with the minimum debate to avoid public scrutiny and censure. This is because the amendments were not designed to provide for greater democracy instead they provided for greater restrictions. The transformation which is heralded by Najib in tabling the Bills is nothing more than an illusion. Like David Copperfield’s magic tricks, the smoke and mirror effect of the Bills cannot stand scrutiny in daylight. Hence the Bills were pushed through in the dead of the night. The Election Offences (Amendment) Bill 2012 has been described by Ambiga Sreenevasan, co-Chairperson of the Steering Committee for the Coalition for Clean and Fair Elections (BERSIH 2.0), as “solely for the purpose of making the voting process less transparent”. The Bill did not implement any of BERSIH’s 8 demands for a clean and fair election or any of the 22 recommendations of the Parliamentary Select Committee. The Bill removed the candidate’s right to have his agents monitor the process of voter identification to ensure that voters are at the proper polling center and directed to the correct polling stream. This is a crucial process because many voters will be denied their rights to vote if they are unable to obtain confirmation that they are at the correct polling center or their name is listed in the electoral roll. There have been many incidents in previous elections where voters were sent on a wild goose chase to find their voting centers. Unable to do so, they eventually gave up and were thus deprived of their right to vote. Pakatan Rakyat and the public have cause for concern that this coming 13th General Elections will be tainted by widespread electoral frauds. The Election Commission has changed the voting centers for 31,294 persons without their knowledge or consent on the pretext of the Election Commission correcting Parliamentary boundaries. This is illegal because any change in a Parliamentary constituency requires the approval of two-thirds majority in the Dewan Rakyat which has not been obtained. There are 6,002 cases where there are between 11 to 20 voters at one address. There are also 2,425,045 voters whose authenticity cannot be verified because the electoral rolls only specified their locality but not their addresses. The amendments to the Election Offences (Amendment) Bill 2012 by prohibiting the presence of observers will lead to reduced scrutiny and prevent electoral fraud. The Government has not provided any convincing argument to justify the reduced scrutiny. Sivarasa Rasiah, the Member of Parliament for Subang, has described the amendments as confirmation of Barisan Nasional’s plans to steal the 13th General Election. The amendment will not improve Malaysia’s score for greater political rights and civil liberties. The Asian Network for Free Elections (ANFREL) recently released a chart assigning a score for political rights and civil liberties to 30 countries in Asia. It demonstrates that Malaysia still has a long way to go in pursuing greater political rights and civil autonomy to keep on par with the democratic development achieved by other countries such as Taiwan, Japan, South Korea, India and even our neighbor Indonesia. In fact, the presence of observers, whether from non-governmental organizations (NGOs) or representing the election candidates is an inseparable aspect of voting process, particularly within a democratic system. In the United States – a country that is widely credited with its relatively complete and healthy democracy, any candidate is allowed to have as many observers to be present during the election and also during the calculation of the ballot paper. The presence of observers shall include every phase of an election, such as in the preparation and mailing of ballots, checking the eligibility of voters, and the opening and calculation of ballot papers and the like. Such amendment to rule out the presence of observers in the booth is conspicuously in conflict with the nature of democracy. What is more, this is overtly in contrast with the political transformation programme, which has been vigorously introduced and promoted by a Prime Minister who portrays himself as the icon of successful transformation while playing down systemic failures and crisis of political legitimacy faced by the BN-UMNO regime. Barisan Nasional was able to approve the amendments because of their majority in the Dewan Rakyat. The amendments would similarly be approved by the Barisan Nasional majority in the Dewan Negara. Therefore the only avenue left for the people to object is by attending BERSIH 3.0. We must know our democratic rights have been stolen. Berikutan Rang Undang-Undang (RUU) Kesalahan Pilihan Raya (Pindaan) 2012 diluluskan pada petang semalam di Dewan Rakyat, Kajian Politik untuk Perubahan (KPRU) berpendapat, rakyat Malaysia bakal menyaksikan pilihan raya umum terkotor dalam sejarah Malaysia apabila RUU tersebut dikuatkuasakan sebagai satu akta nanti dan pelaksanaannya terpakai semasa Pilihan Raya Umum Ketigabelas (PRU-13). Memandangkan PRU-13 kian menghampiri, Dewan Rakyat semalam pada hari terakhirnya pula tergesa-gesa meluluskan sebanyak 8 rang undang-undang sampai ke saat terakhir majlis dewan ditutup tirainya, antaranya termasuklah RUU Kesalahan Pilihan Raya (Pindaan) 2012 yang menggandungi pindaan tertentu yang penuh dengan pertikaian dan mampu mengubah wajah proses PRU-13. Pindaan yang paling signifikan dan harus diberi perhatian sepenuhnya adalah berkenaan dengan subseksyen 26A(2) dan (3) di bawah Barung hendaklah diadakan oleh Suruhanjaya Pilihan Raya, di mana kehadiran pemerhati di barung adalah tidak lagi dibenarkan. Pindaan yang membatalkan kehadiran pemerhati dalam barung bercanggah dengan prinsip demokrasi yang bersifat partisipasi dan bakal mencorakkan proses pilihan raya yang memihak kepada rejim pemerintah . Seperti yang turut dinyatakan dalam pindaan subseksyen yang dinyatakan di atas, alasannya bagi meniadakan peruntukan bagi membenarkan kehadiran pemerhati adalah bagi menangani kesesakan dan kesukaran yang timbul semasa petugas pilihan raya melaksanakan tugas mereka. Alasan ini adalah amat tidak munasabah. Sekiranya kesulitan sedemikian timbul dalam proses mengundi, Suruhanjaya Pilihan Raya (SPR) seharusnya mengkaji semula mekanismenya kerana kesulitan sedemikian sesungguhnya merupakan masalah teknikal yang boleh diatasi melalui penambahbaikan prosedur dan bukannya dengan menolak kehadiran pemerhati yang jelas bercanggah dengan aspirasi rakyat terbanyak apabila konteks tuntutan dan gerakan Bersih diambil kira. Selain itu, subseksyen 11(1)(c) di bawah Hukuman dan ketidakupayaan kerana perbuatan rasuah yang pada asalnya menyatakan mana-mana orang yang “mencetak, menerbitkan, mengedarkan atau menampalkan atau menyebabkan supaya dicetak, diterbitkan, diedarkan atau ditampalkan apa-apa iklan, surat sebaran, pelekat atau poster yang berkenaan dengan mana-mana pilihan raya dan yang tidak mengandungi pada mukanya nama dan alamat pencetak dan penerbitnya;” yang akan diambil tindakan sekiranya disabit kesalahannya telah disingkirkan dalam pindaan yang baru atas alasan sukar dikuat kuasa. Memandangkan proses pilihan raya masih dipenuhi dengan taktik kotor dan pembohongan yang jelas mencaburi hak rakyat dalam menyertai dan mengundi dalam pilihan raya – khususnya masalah senarai daftar pemilih yang tidak bersih dan penggunaan senarai daftar pemilih berlainan pada hari pengundian, sekiranya pindaan-pindaan yang menafikan kehadiran ETM, EMU atau wakil politik dan juga pemerhati dalam barung mengundi pada hari mengundi dikuatkuasakan, jelas dakwaan bahawa PRU-13 akan menjadi pilihan raya yang terkotor itu bakal menjadi kenyataan yang cukup menyedihkan.